In 2015, Clean Up Cincy assembled 350 students to clean up two Cincinnati neighborhoods. 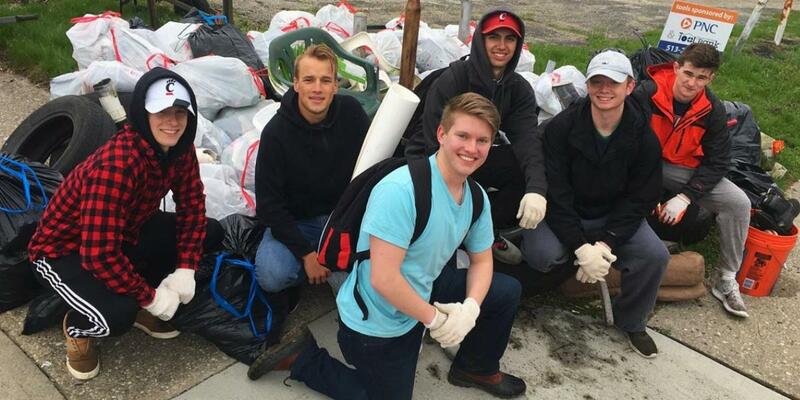 Since then, the University of Cincinnati’s cleanup program has grown to over 1,000 volunteers each semester, serving more than ten neighborhoods per event. To date, student volunteers have worked in over 25 neighborhoods in Greater Cincinnati, making Clean Up Cincy the area’s largest student-led beautification program. According to Kyle Wilson, President of Clean Up Cincy, the program has collected nearly 10,000 bags of trash, dozens of tires and hundreds of bags of recycling. Wilson majors in Urban Planning at The University of Cincinnati and plays a significant role in planning and executing Clean Up Cincy’s events. How Does Clean Up Cincy Work? Clean Up Cincy holds two large neighborhood cleanups each semester. During the first week of April and the first week of October, over 1,000 volunteers meet on campus for breakfast before being assigned one of a dozen different neighborhoods. Buses take students, faculty and other volunteers to their districts and the cleanup typically runs from 9:30 am – 12:30 pm. In addition to the large-scale neighborhood cleanups, Clean Up Cincy holds monthly cleanup events. These are typically planned after a request is made by a local organization in need of volunteers. “We also have a relationship with Keep Cincinnati Beautiful, who provides trash bags, recycling bags and gloves for the events,” Wilson said. Keep Cincinnati Beautiful brings thousands of volunteers together every year from March to November through the Great American Cleanup – the nation’s largest community involvement program. Clean Up Cincy works closely with Keep Cincinnati Beautiful to help the community with large-scale cleanups. These events can involve anything from picking up litter and painting buildings to planting flowers and clearing illegal dumpsites. Great things happen when people come together. Clean Up Cincy provides students at The University of Cincinnati with the opportunity to work side-by-side to beautify their community. To learn more about upcoming clean up events, visit cleanupcincy.com. This is part of a Dumpsters.com series highlighting organizations working to clean up their communities in the Cincinnati area. Let us know if you’re planning a cleanup event in your neighborhood – we’d love to hear about it!